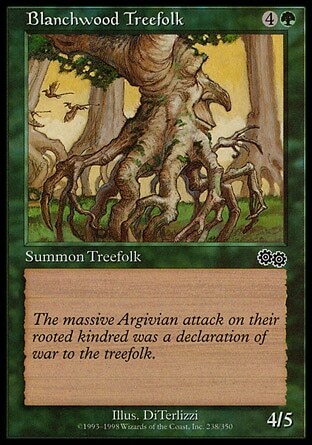 Fellow dorks like myself may have, at one time or another, played the Magic: The Gathering trading card game. I will admit there was a phase where the crew and I played often. It was fun, but it was pricey as all get up, so now we may bring out the cards like once or twice a year. Even then, I'm in it for the artwork as much as anything else. And there have been some funny pictures over the years that linger with me long after I've initially seen them. "Greatest" is clearly a misnomer; these are just some of my favorites. There are also like three million MtG cards, so I obviously have not seen them all. You may also notice that these cards are mostly green; since green has the most creatures, they have the most funnies, too. Also this will most likely turn into a series, since goodness knows I'll need some article ideas down the road. This one is a particular favorite of mine because toads are funny creatures. Just how morbidly obese it is already warrants a chuckle (I can't believe it would only deal two damage though! ), but I love the extra addition of the mouse or whatever that is on the branch just watching him. I can only imagine the mouse doing some taunting, and the toad can only sit there and be like "Maaaaan" because he's too bloated to move. Also this card reminds me of how I feel after a large meal, so there's nostalgia points for that. I've never even used this card in a game, so it could be terrible for all I know (it looks like it, but I tend to undervalue actual good cards). But I mean, how can you not like that picture? There's a goblin wearing a chef's hat! He's holding a vat of something disgusting, probably earwigs, and is feeding it to Russell Crowe. On top of all of those shenanigans, the mug in front of Crowe is smiling. Wins all around. Sometimes simple is the best. Blanchwood Treefolk doesn't have any special abilities, and there's nothing overtly special about this picture. But for me there's something quite precious about a tree sprouting multiple legs and being able to walk across the land, all with a smile that can only come from a wise grandfatherly figure. Fantastic. The very first time I saw this card, I didn't see the little 2 in the casting cost (which is on the top right of the card). Without that 2, this then becomes a 5/5 for two swamps, which is AWESOME. Since I know not all of my readers are as nerdy as me, if you can get a creature with more power (the number to the left of the slash on the bottom right) than the card costs (the combination of things at the top right), it's usually a good deal. Usually. In this case, it's still a good deal, just not as awesome as I initially thought. The main point of that rant was to show that the 2 is very hard to see--try and find it yourself! And the picture speaks for itself--if you don't think this crazy-looking thing holding a tiny man like a GI Joe is funny, then don't bother talking to me. I didn't even know this card existed until just a few moments ago, but I needed to include it. 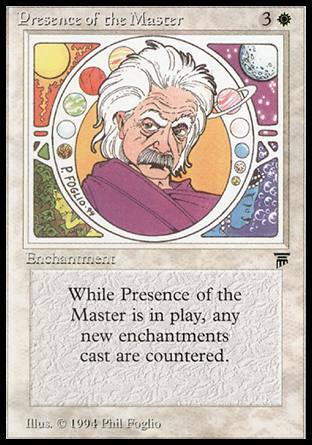 It's Albert Einstein on a trading card surrounded by 10 planets. I don't even know what the last one is (Pluto's moon? ), and to add to the chaos of the inner circle, each corner has a different element going on (my personal favorite is the sun). There's just so much happening that it had to be included.